All of you know how much I adore anything from Amy Harmon. Her stories always grip me emotionally, the poignant messages she weaves into the story always linger long after I’m done. 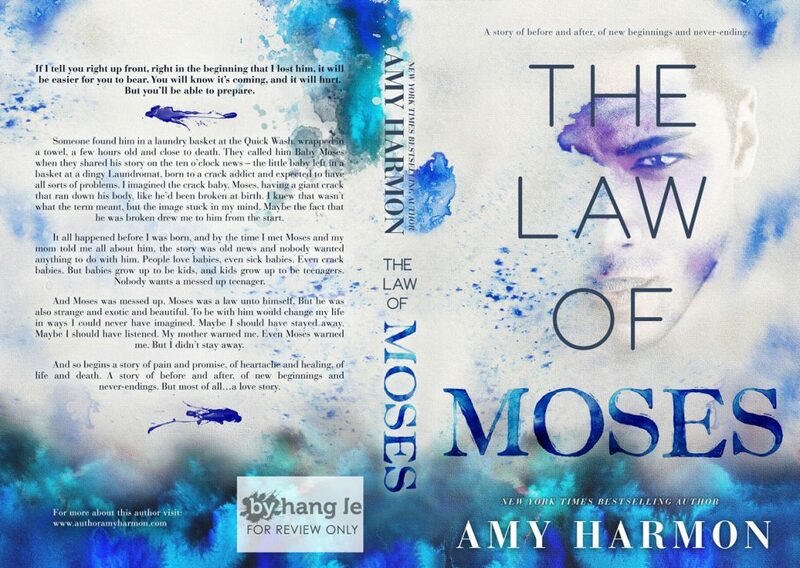 The Law of Moses is the next novel I eagerly anticipate and it’s coming November 27th! The cover is stunning, striking and the story behind it, equally as beautiful I’m sure. Read the excerpt below and make sure to add to your TBR! You’ll be able to pre-order mid month. I jerked and Sackett shifted, not liking the spike of energy that shot through me or the fact that my fingers had yanked at his mane. Moses stood silhouetted in the barn door, holding what looked to be a large canvas in his hand. I loosened the cinch that secured the saddle around Sackett’s middle and pulled the saddle from his back, hoisting it onto the saddle horse and removing the blanket beneath without looking at Moses. I was kind of surprised that he remembered Sackett’s name. Moses took a few steps inside the barn and I could see a small smile playing around his lips. I gave Sackett a firm pat on his rump signaling I was done, and he trotted off, clearly eager to go. “You’re back.” I said, refusing to embarrass myself further by getting angry. I rolled my eyes, and he grinned, making me grin with him before I remembered that I was embarrassed and ticked off that he had kissed me and left town. It felt a little too much like the past. The grin slipped from my face and I turned away, busying myself shaking out the saddle blankets. “So why did you come back?” I kept my eyes averted. He was quiet for a minute, and I bit my lips so I wouldn’t start to babble into the awkward silence. My head shot up, and I met his smirk with confusion. I just shook my head and laughed, both and embarrassed and pleased at his underlying meaning. “Shut up, Apollo,” I said, and it was his turn to laugh. Amy Harmon has been a motivational speaker, a grade school teacher, a junior high teacher, a home school mom, and a member of the Grammy Award winning Saints Unified Voices Choir, directed by Gladys Knight. She released a Christian Blues CD in 2007 called “What I Know” – also available on Amazon and wherever digital music is sold. She has written six novels, Running Barefoot, Slow Dance in Purgatory, Prom Night in Purgatory, the New York Times Bestseller, A Different Blue, Making Faces and now, Infinity + One. 3.) Books, and more books! 1my children, 2 my grandchildren 3 my love of reading 4 living-cancer survivor for 6 years and 5 my pet Benny so I do nt live alone! My mom, my life, my memories, my friends, me being healthy. 5. Being able to read. 3. My morning run on beautiful trail. 5. Good food to eat!